DP4400 backup/recovery appliance and… everything is ready! Let’s imagine we have chosen our dreamed backup solution. It was not easy, we had to compare and check plenty of parameters. But it is over. We know what data protection is best for us. Is it really over? Can we really just wait for delivery of our preferable solution? we can have poor backup/recovery performance best. More probably we will expirience instability of our backup solution or in the worst case data loss (f.e. because of currupted de-dup database). Also implementation of the above take us weeks if not months. This is pain for OS guys, Virtualization guys, Network guys. Do we really have to take risk (as company, personally) for design / implementation / maintenance? DP4400 is 2U backup/recovery appliance that is ready to backup our environment just after power on. The ease is not compromised with capabilities. We get top market features ready to run. Just after power on and providing our IP addresses. What functionalities does DP4400 provide? What about desing / implementation / maintance of DP4400? 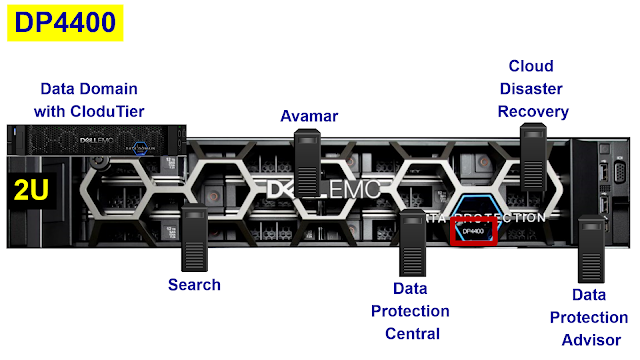 DP4400 is installed in rack - what do I need to do perform backup/recovery? What environments can DP4400 protect? And we can use Cloud as Disaster Recovery! What features we can enjoy with DP4400? Extremely important for ransomware attack – we almost not lose any data! Every backup is full backup! Zero time recovery with SSD disks speed! Finding phrases in backed up documents in less than 1 second! All the above we always get - no matter which DP4400 we will order! All the features are ready to work, configured in every DP4400. Let’s say I take under consideration DP4400. What options do I have? 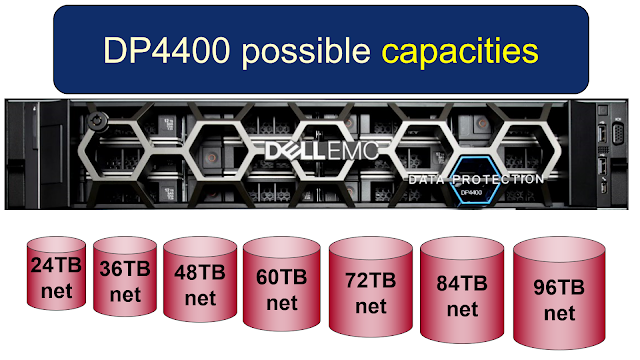 The upgrade is easy because physically DP4440 always come with full capacity (96TB net). So for example upgrading from 24TB to 60TB is just entering the license. How big DP4400 do I need to protect my environment? You shall contact Dell EMC or Dell EMC partner for sizing DP4400 for your environment. Anyhow, the rule of thumb tells us the DP4400 24TB net allows us to protect 25TB environment with 30 days retention and 10TB environment with 5 years retention. The same proportion we can use for bigger capacities. For price you shall contact Dell EMC. Vendor claims that price is very attractive – less than buying components separately. And below there links to topics covered in the video. What is new in Avamar 7.5? DPS DD VE - a great license package for start! And of course at the great price! DPS DD VE is licensed per number of physical processors (occupied sockets). And that is all. We have the price for DDVE / Avamar / RP4VM / Search / Central / Advisor for our environment. Those solutions have included all possible features & modules! What is the price for a single processor in DPS DD VE package? I checked and… I was shocked! Really makes sense to ask IT integrators / distributors for DPS DD VE single physical processor price. For those who know the super price-attractive DPS4VM license package (https://youtu.be/MUWO46p4iy8), I can tell you that DPS DD VE is lots of cheaper! How does the typical backup architecture look like when using DPS DD VE? Additionally, apart from the above, the package contains all functionalities of RecoverPoint for Virtual Machines (RP4VM) - another top market solution. What exactly do we get within DPS DD VE package? DPS DD VE is license package calculated per physical processor. We need to purchase DPS DD VE for number of processors that we have in protected environment. 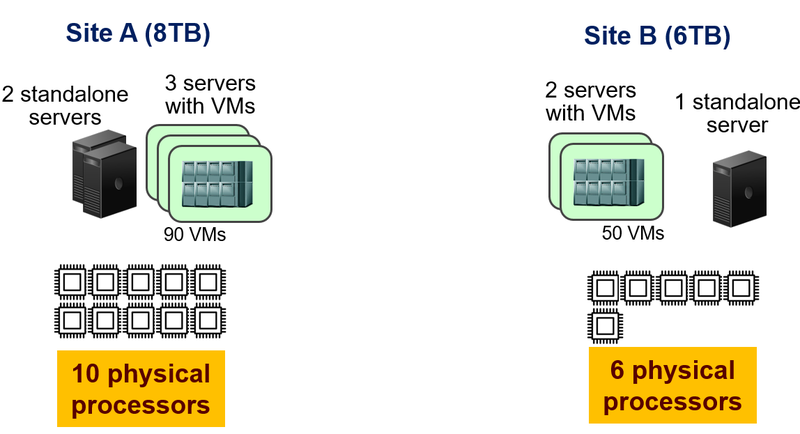 For example if we buy DPS DD VE for 10 processors, we can protect 150 VMs with RP4VM. What if my environment grow? If we grow from 15 servers to 40 servers - no problem. It is just enough to purchase missing physical processor. So in future, while growing, no change to our environment - just replacing media. Backup software, interface, all features - it stays with us. We already have the enterprise ones! Who shall be interested within DPS DD VE? I have talked with my friend from Cloud Provider. He compared DPS DD VE against another solution. DPS DD VE was 25K Euro cheaper for 5 years assuming 20 physical processor customer. And he said that DPS DD VE functionalities are absolutly #1. Again. Have a close look at DPS DD VE - a very strong package. - Hm… Can you make Proof of Concept (PoC) at customer site? Another solution could NOT perform a single backup during 6 months! During another 2 months, this vendor could NOT perform restore!!! And it was just 300GB SAP/Oracle. Is it standard on the market? Or maybe I can still expect easy backup & restore of my SAP/Oracle. - It cannot be NO... Before anyone (customer, you, me) invest in tests, I want to explain what we will achieve after PoC. If fine, I have no problem to prove the architecture in tests. Customer was desperate to see that its SAP/Oracle can be easily backup&restore. Functionalities, performance did not matter. YES! 5 minutes to make FULL backup! · Implementation of backup environment: 6 hours! I was shocked that he was shocked!!! 100% of successful backups & restore! We have available a new Data Domain model: DD3300. The values above gives us info, how much net space we have for de-duplicated backups. How can I judge, which of DD3300 fits to my environment? 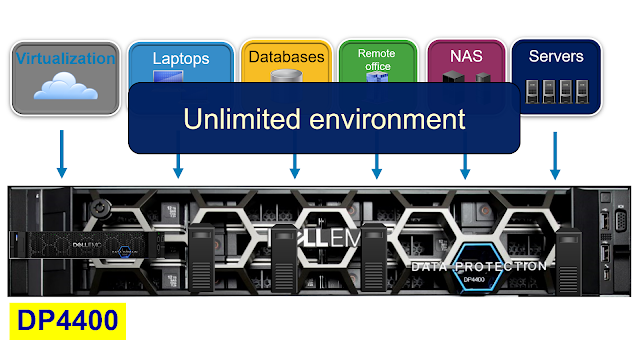 Best approach is to use Dell EMC sizer via partners / integrators / distributors. Number of TB in size of environment above means how much data we have on production to protect (front data). In other words this is the size of single full backup of all my data (without any compression / de-duplication). For example, having VMware 8TB large and 2TB on standalone servers, it means I have environment with 10TB production data all together. And probably I shall think about DD3300 16TB. Another question is, how long can I keep backups on DD3300? Customers keep backups on Data Domain from 14 days to 5 years or even longer. The most common retention is 30 days. If we want to keep data for long (years) on DD300, we shall choose for sure higher capacities (for example DD3300 16TB net for environment 5TB large). If 1 month retention is fine for us usually DD3300 16TB is fine for environment about 12-17TB. Again best is to use sizer from partners / vendor. 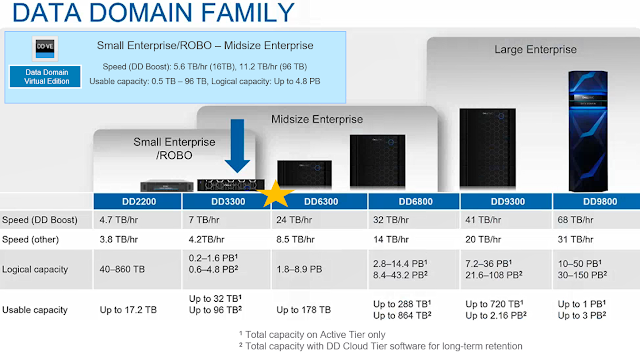 DD3300 offers huge 7TB/h backup speed. It means that FULL backup of 30TB environment we can have in something like 4 hours! Anyhow, I would like to point to number of streams. DD3300 16/32 net gives us 90 parallel backup streams. Having good backup software we are able to backup almost 100 Virtual Machines in the same time! DD3300 has built-in export of old backup to cheap S3 storage. This is called CloudTier. So if we have long retention for backups (years), DD3300 will automatically move backups older than a month (for example) to S3 storage making free space for fresh backups. No additional hardware is required, anyhow we need a license. What about the upgrades? Can I upgrade between DD3300 variants? If we have bought DD3300 4TB net. We can upgrade from DD3300 4TB net to DD3300 16TB net. If we have bought DD3300 16TB net. We can upgrade from DD3300 16TB net to DD3300 32TB net. The existing DD2200 is available until something like August 2018. Avamar 7.5 - what is new? 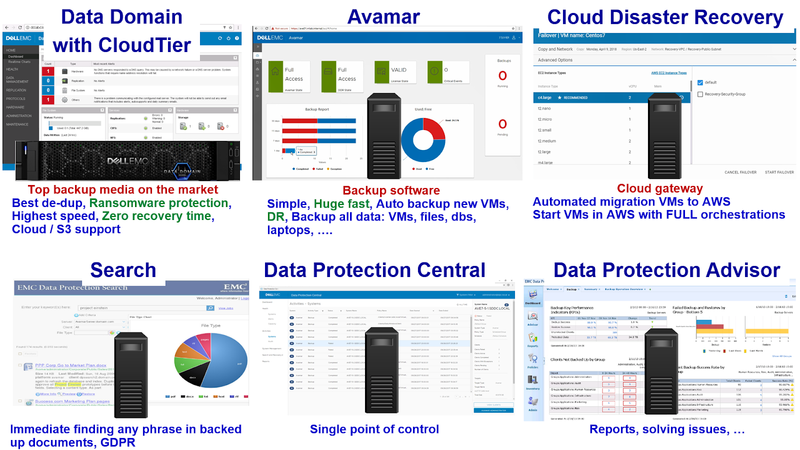 The latest version of Avamar 7.5 provides a lot of new features in virtualization / cloud / application backup and more. 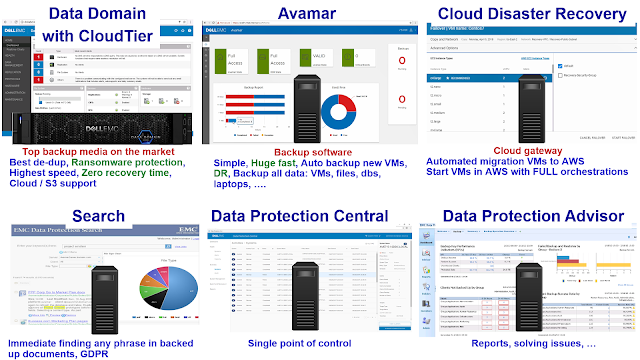 Avamar 7.5 appears on the market exactly half a year after the previous version. The speed of development is impressive! OpenStack image backupFull backups with reading delta from disk Avamar 7.5 implements its own CBT mechanism that reads only changed data since the last backup. Anyhow we can enjoy the full backup. Full backup in couple of minutes with no load of OpenStack. It does not make sense to backup pagefile as it is as new one (from scratch) after restore. pagefile can be even 16GB large. By skipping pagefile Avamar saves money (less backup storage required) and speeds up the backup. Disaster Recovery in the Cloud Avamar can clone backups to the cloud. We can restore data or start our applications in the Cloud for tests or in case of Disaster Recovery. 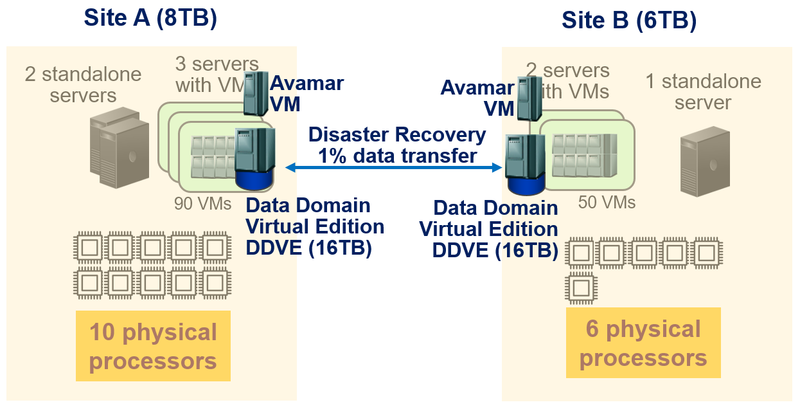 Moving old backups to S3 storage Avamar can move old backup to cheap S3 storage (local or in the cloud) via Data Domain Cloud Tier. It saves money and allows efficient use backup storage. VMware application consistent backups Avamar backups VMware images and guarantees that SQL backup is consistent. We can restore the image of VM, just SQL databases, or recover database to point in time. Register to 30 min webcast that discuss NetWorker 9.2 new features in details. Thursday, 28 September, 10:00 CET (Vienna, Prague, Berlin time). There has been released a new version of NetWorker 9.2 with plenty nice features. You will find list all of them at the bottom. Why the backup to S3 media with source de-duplication is so important for us? S3 storage is the cheapest medium. In addition, thanks to source de-duplication, we minimize network costs, backup media. If we do backup resources located in the cloud (Amazon / Azure / ...), then S3 storage is the cheapest medium available in the public cloud. With source de-duplication, we additionally highly reduce the cost of backup storage and the cost of the cloud network – 2 most important cost factors. Storage S3 is cheap and secure. However, it is not the fastest medium. De-duplication on the source allows us to send / write to S3 storage very minimum amount of data. Thus, anyhow we achieve very good performance. Why? Because of source de-duplication, there is almost no data sent, no data writing so speed of the network / storage is not important. The performance is maybe not as huge as with Data Domain but better than using ordinary disk. What if we need to protect data in the cloud locally, in our Data Center? Briefly: NetWorker is the fastest and cheapest solution for cloud backups! The cheapest possible backup cost! Having NetWorker / Data Domain, we are sure that even in the case of ransomware or hacker attacks, our backups are safe. Please keep my backups for 5 years, but for 14 days do not allow anyone to change/ delete those particular backups. In this case neither the virus nor the hacker nor us (administrators) can delete/change the backups within the defined 14 days. This is standard NetWorker functionality available at no extra charge / license. At the backup price we have an additional layer of protection against cyber-attacks. This is also important from GDPR perspective. One of the requirements is to provide security and data integrity. Have fast and 100% successful recoveries!